This year’s list of Rhodes Scholars is remarkable for many reasons. Almost two-thirds of the recipients are women and nearly half are first-generation Americans or immigrants. But one scholarship winner in particular made history this year. 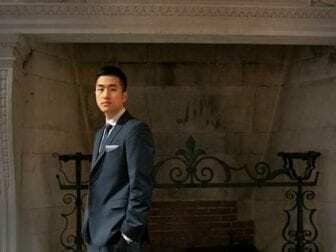 Harvard University student Jin Park has become the first recipient of Deferred Action for Childhood Arrivals — DACA — to earn a prestigious Rhodes Scholarship. “I think it’s important to really understand where you’re coming from, understand who your peers are, who your community is,” DACA recipient and future Rhodes Scholar Jin Park says. NPR’s Scott Simon spoke with Park about what the scholarship means to him and to other DACA recipients. Jin Park: It means to me personally a lot because growing up as an undocumented person in New York City, I’ve had a lot of formative experiences around particularly how my parents were treated at the face of the law and how I personally experienced some of these social institutions. And so, these experiences as a childhood informed a lot of the ways that I wanted to use my talents for the world. And so having this opportunity for me is really meaningful. So, my dad works as a line cook and restaurant and my mom worked in beauty salons her entire life. So, kind of watching my parents do that combined with also seeing my parents get denied health care, access to health care, health insurance, those experiences have informed the fact that if you’re an undocumented person in America, you don’t really have a full shot at full opportunity. So that’s kind of what I wanted to impart to my classmates. Strangely, I feel really optimistic. I think regardless of the occupant of the White House, it’s important to keep the focus on some of these bigger questions — who belongs in America? Who is American? And who are we going to provide the full benefits of membership in America? These are really big, almost theoretical questions that are going to remain. The answers are going to be necessary even after the current occupant leaves the White House. So, I think the real implications of the answers to these questions are important. They have genuine real consequences for immigrants. So, I think that’s where we really have to to keep the focus. You have words for other DACA recipients who might be anxious about what’s going on in this country now? The biggest thing that I’d say is understand your roots, stay true to your roots. I think it’s real important to really understand where you’re coming from, understand who your peers are, who your community is, who you want to serve, because going forward I think that’s where you draw your strength. I draw my strength, personally, from visiting my dad in the restaurant and kind of touching his hand and feeling the blisters and the roughness of his hands and that always reminds me that I have to keep the focus on our community. That’s where I have to always come back. So that’s the kind of advice that I’d give: Stay true to your roots.